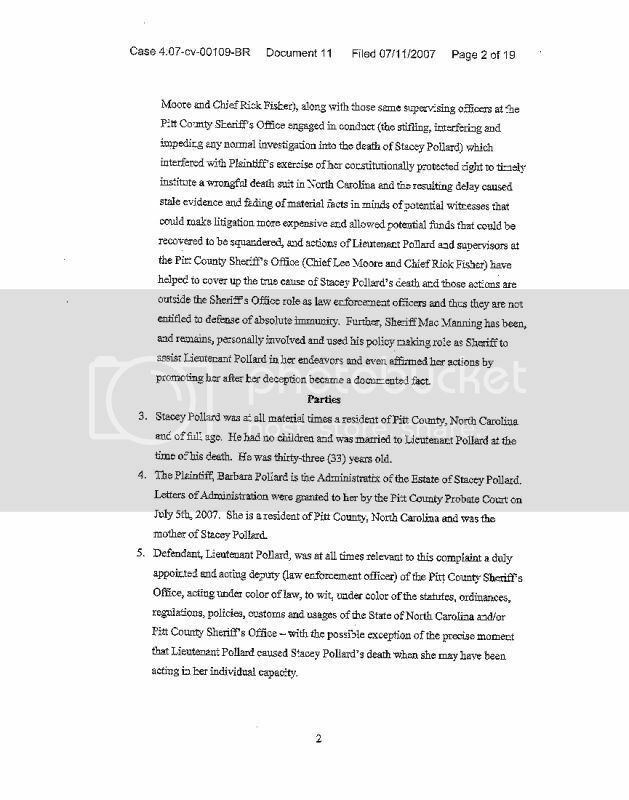 Behind The Blue Wall: [NC] Will there ever be charges in the death of then-deputy's husband, Stacey Pollard? 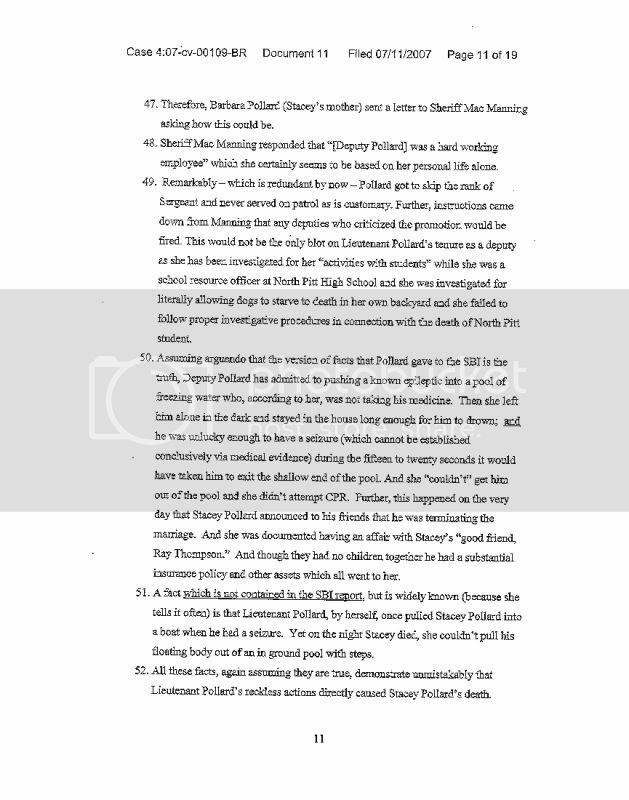 [NC] Will there ever be charges in the death of then-deputy's husband, Stacey Pollard? 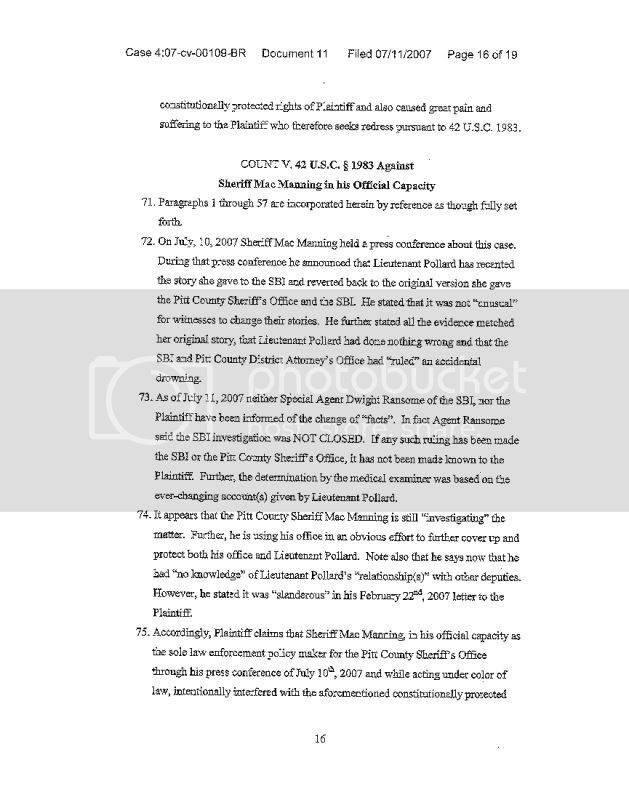 [Excerpts] A former Pitt County Sheriff's Office deputy is suing the county, Sheriff Mac Manning and Chief of Investigations Lee Moore, according to documents filed at the Pitt County Courthouse. 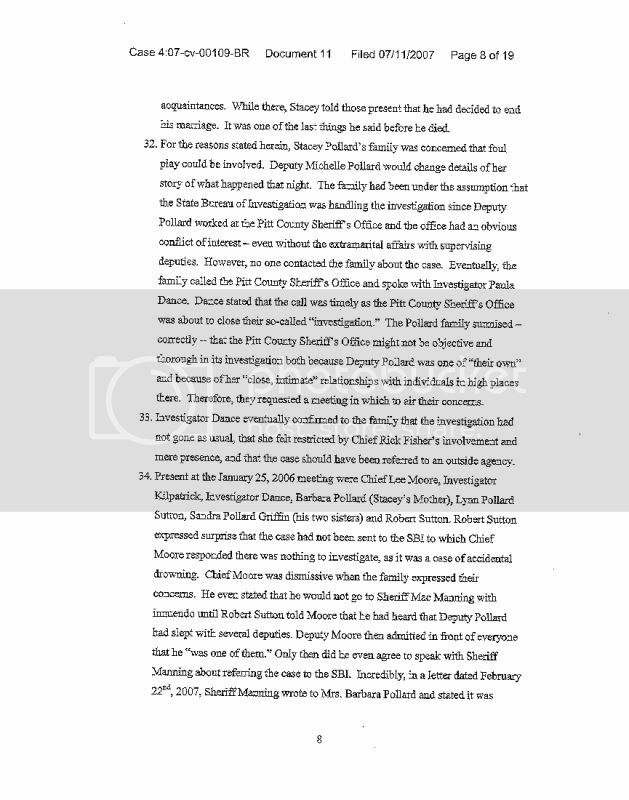 Attorneys for Paula Dance filed the suit just before 4:30 p.m. Tuesday, claiming the defendants caused Dance emotional distress and violated public policy during her investigation into the death of Stacey Pollard... Dance was the lead investigator in the case after Pollard drowned in the pool outside his Pactolus residence Nov. 18, 2005. 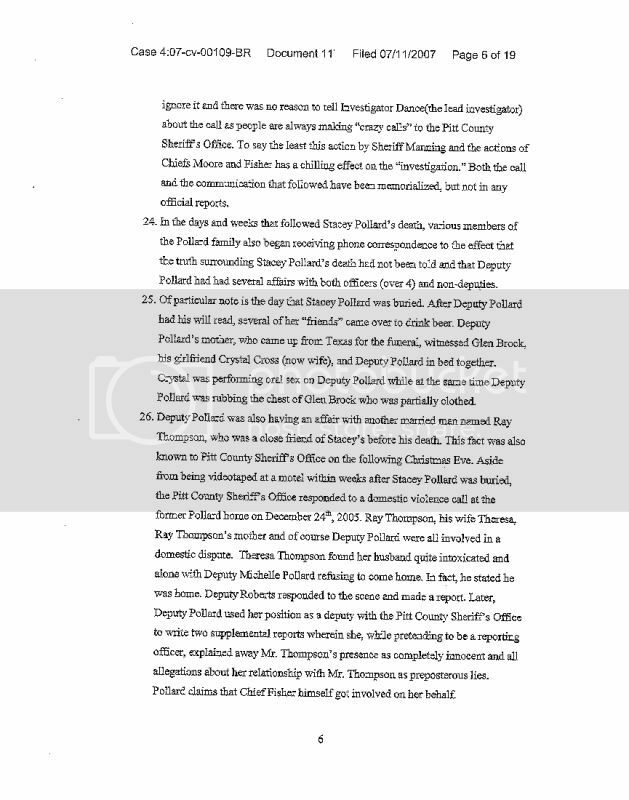 Pollard is the husband of sheriff's deputy Lt. Michelle Pollard... 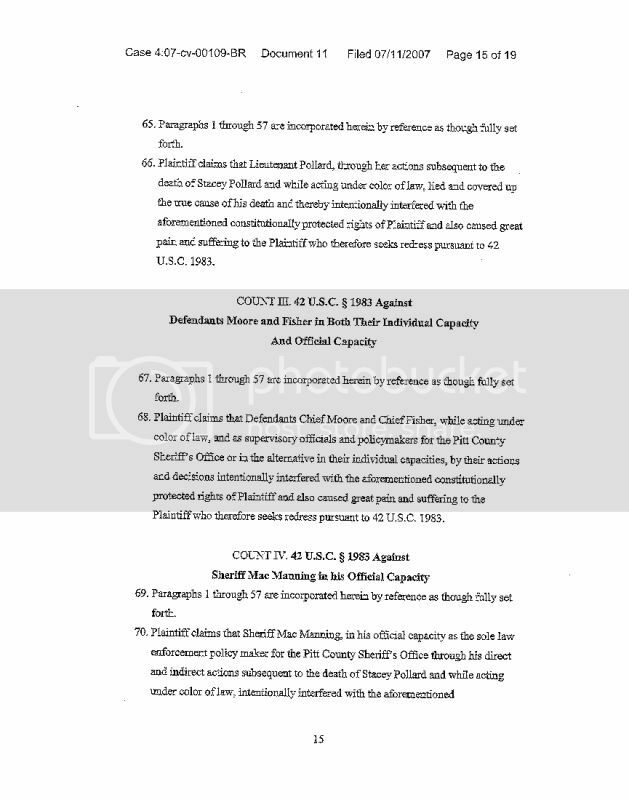 The brief states Dance's ongoing concerns that a proper investigation could not be conducted because of the working relationship with Pollard's wife prompted interrogation and persecution from her superiors... Judge Earl Britt tossed out a case alleging sheriff's officials had a role in Pollard's death and an alleged cover-up. 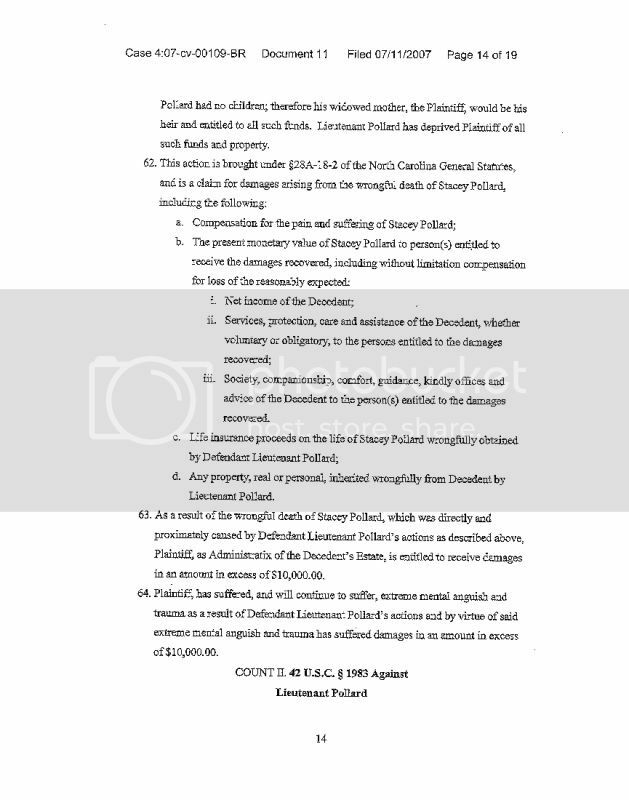 Plaintiff Barbara Pollard's wrongful death complaint was better suited to a state court, Britt ruled. 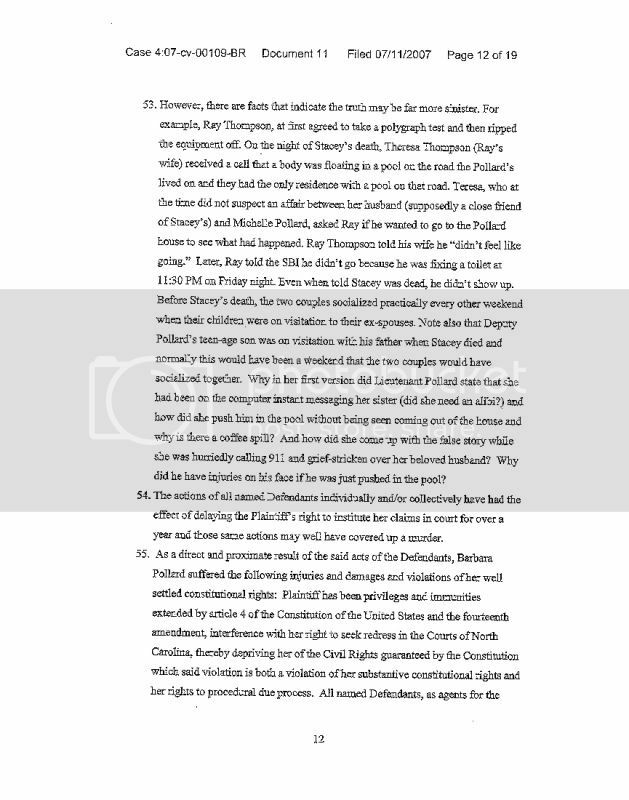 Further, Britt denied Pollard's claim that the purported cover-up violated her civil rights. 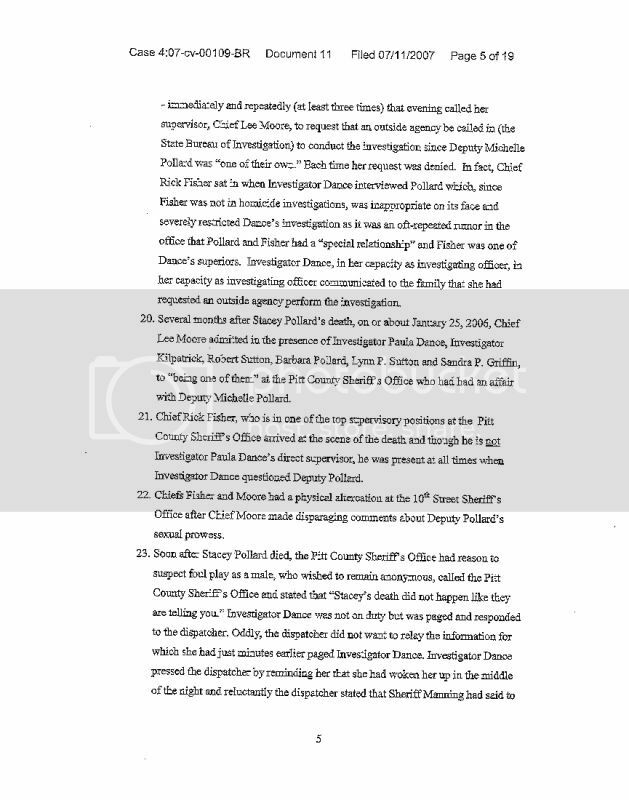 [Excerpts] A former Pitt County Sheriff's investigator [Paula Dance] suing Pitt County, Sheriff Mac Manning and Chief Lee Moore has voluntarily dismissed her case, according to courthouse documents... Attempts to reach Dance's attorney were unsuccessful. it's about time we get some national attention on this lowlife maybe they will do a dateline on her! she is a trailerpark living POS!! The time has come for Pitt County to wake up and really see what this woman is & ALWAYS has been! I have known this woman for over 15 years & I can tell you that her history is not any better than her present! Go as far back as when she worked at North Pitt ask those students who were once kids ........That are NOW adults what went on I bet you they'd talk now! As far as her poor husband Family! I am so sorry that a good MAN got involved with such a low life as Michelle!!!!!!!!!! 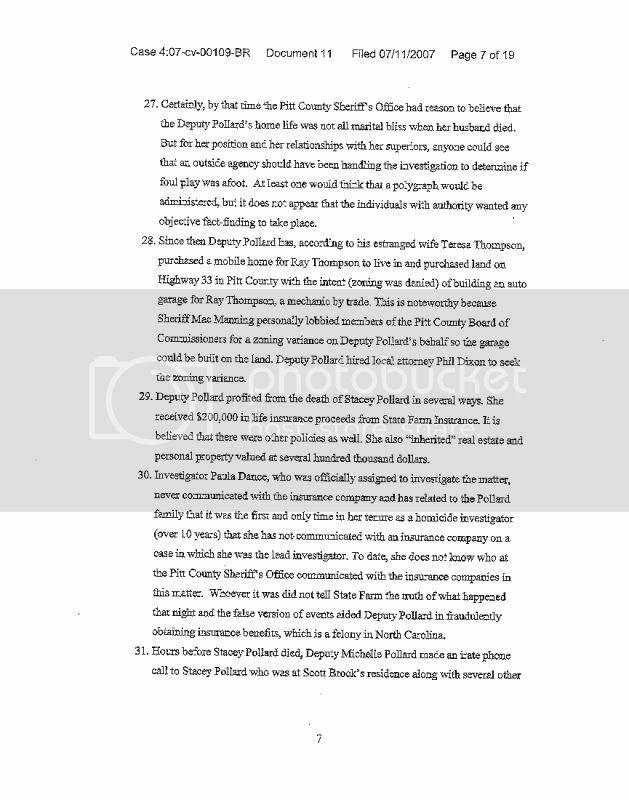 Bankruptcy Filing Stalls Civil Lawsuit Against Former Sheriff’s Lt.
Another development in a story we have been following for more than a year now. 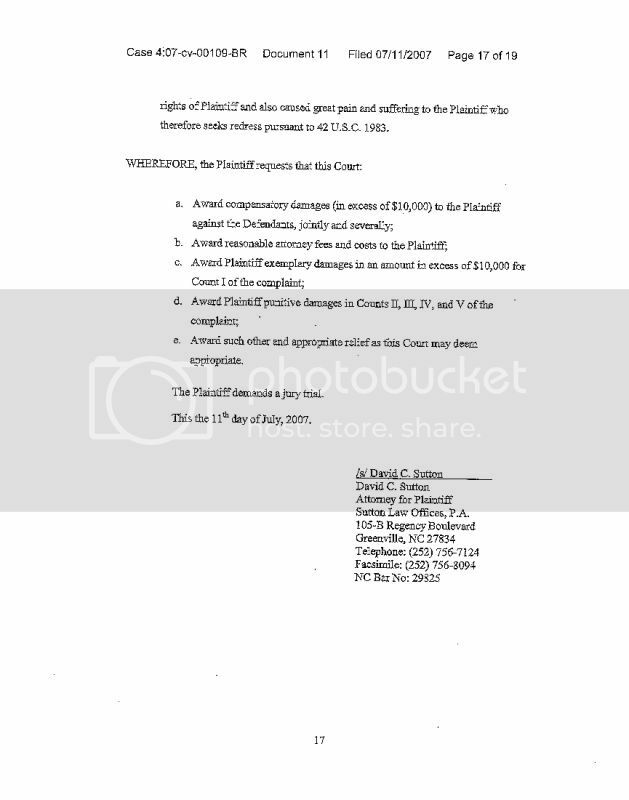 A former Pitt County Sheriff’s Department Lieutenant has filed bankruptcy. 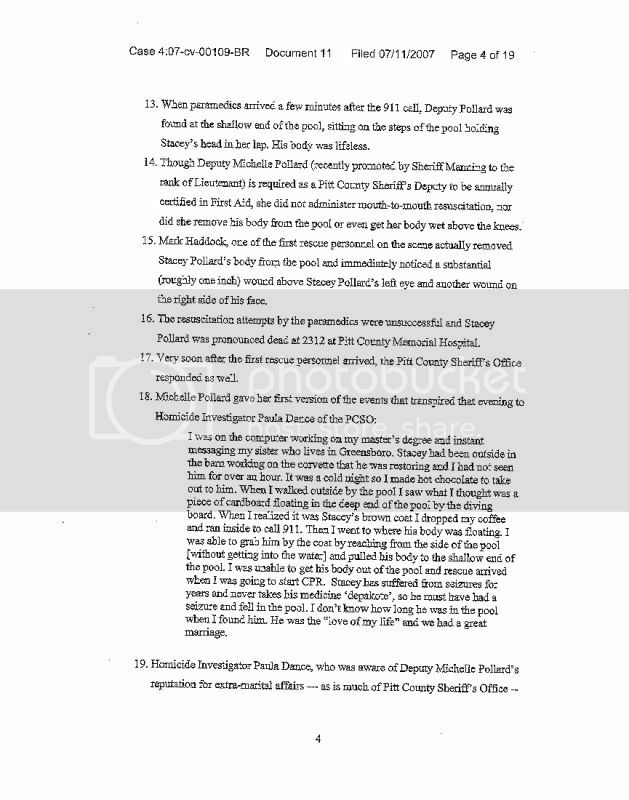 Michelle Pollard’s husband drowned in their pool in 2005 and last year his mother, Barbara Pollard, filed a wrongful death lawsuit with the state courts against Michelle Pollard. That case was supposed to be heard in civil court today but court officials say it is at a stand-still because Michelle Pollard filed for Chapter 13 bankruptcy last month. That lets wage earners work out a plan to pay off their debt. Bankruptcy court officers say she named Barbara Pollard as a creditor and that the civil case won’t resume until the bankruptcy details are worked out. 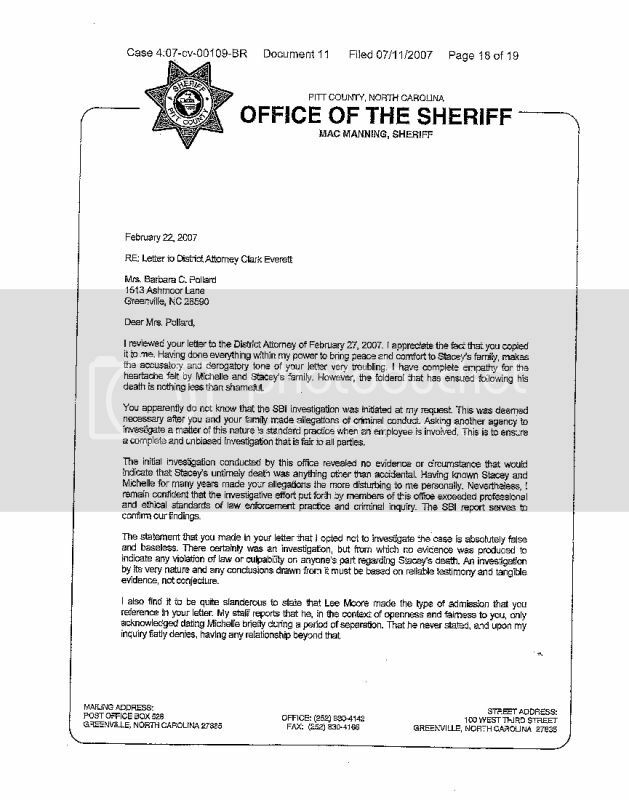 Last month the SBI arrested and charged Michelle Pollard with telling a suspect that detectives were investigating her. 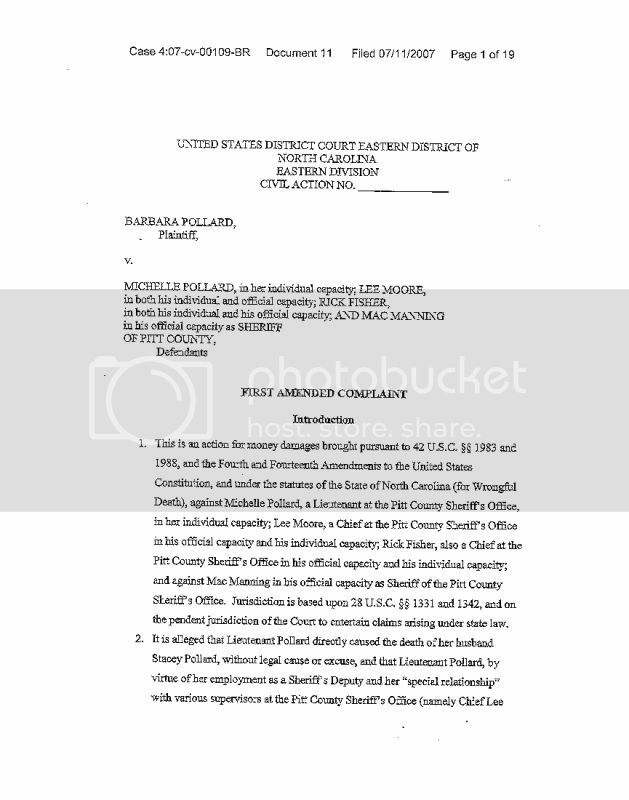 A Pitt County Grand Jury indicted Pollard on charges of obstruction of justice and willful failure to discharge duties of her office. can you even think that we are still paying her.....she is on workmans comp from something that didn't even happen at work, Thanks Mac keep sticking it to us!!!!!!!!!!!!!! 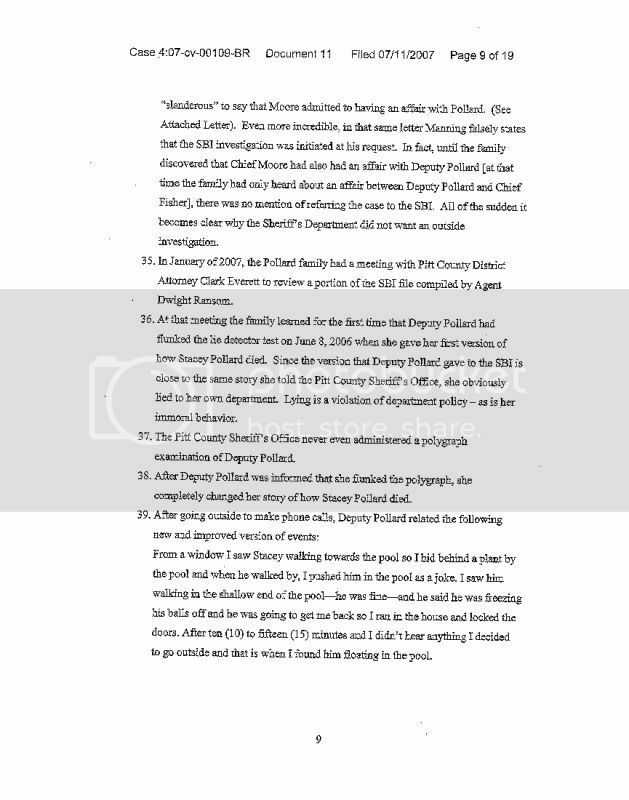 According to what i have read, the husband's case needs to be reopened. What kind of example does this set for the citizens of Pitt County???? 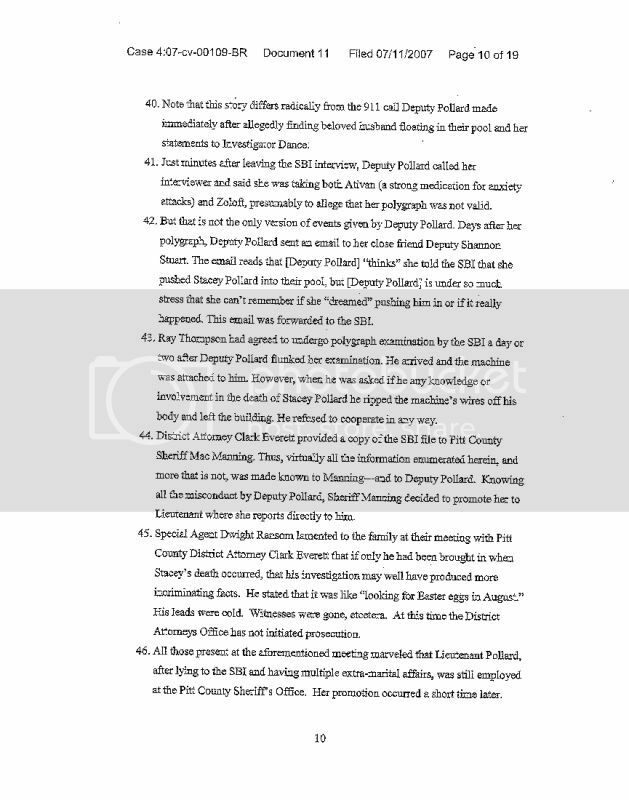 I was born and raised in Pitt Co.The Sheriff's Dept.has always been involved in questionable dealings.I was at a home one afternoon when an officer drove up with the Sheriff ( not Manning)to collect money so that the people at that house could continue to sell drugs. right now I am glad she is in jail. she was shady even at north pitt when I went there. I hope she gets all the time the forts can throw at her. and everyone that was involved gets some too. glad there is a new sheriff in town! 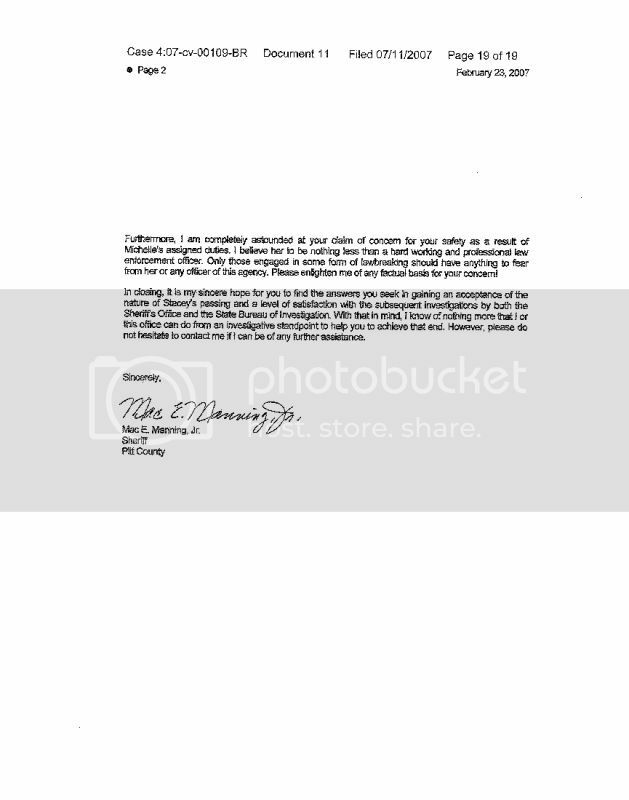 Excellent!!!! There's something more I'd say but I am NOT going to risk giving anyone grounds for an appeal. She's been found guilty of negligence in Stacy's death, as she should be. As a Law Enforcement Officer, LEO, she knew, and should have administered immediately, CPR. She let him drown, and did not try to administer any First Aid, that she was trained in. Sure hope they do reopen the criminal case.